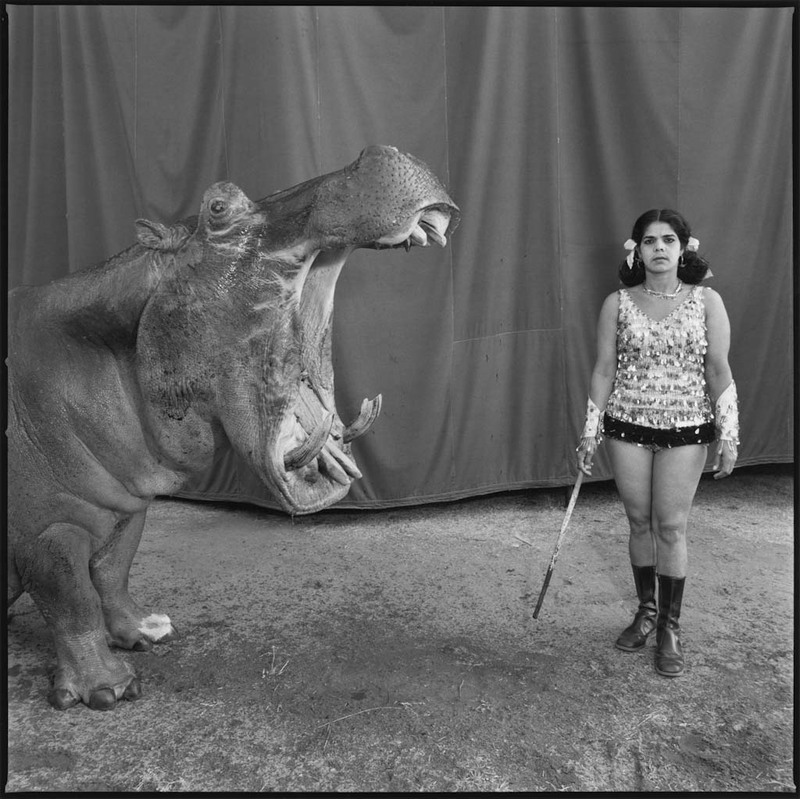 Hippopotamus-4 photo copyright by Mary Ellen Mark. Italian American Club photo copyright by Mary Ellen Mark. 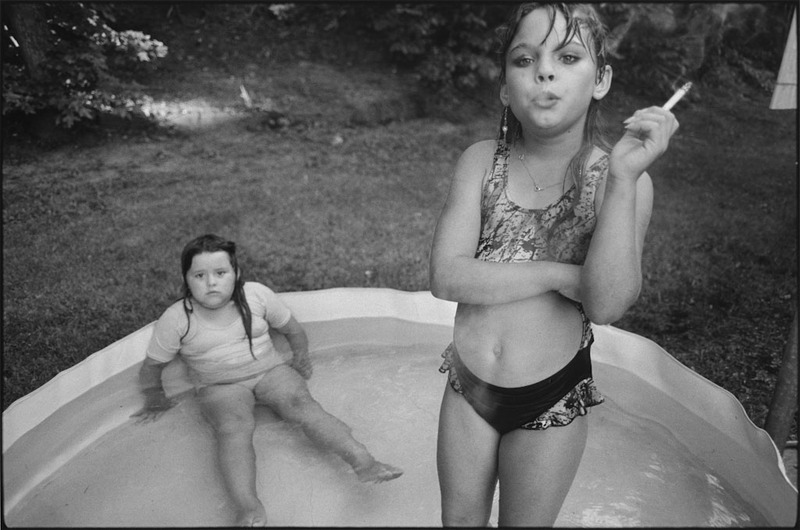 Amanda and her cousin Amy, Valdese, North Carolina, USA, 1990 copyright by Mary Ellen Mark. 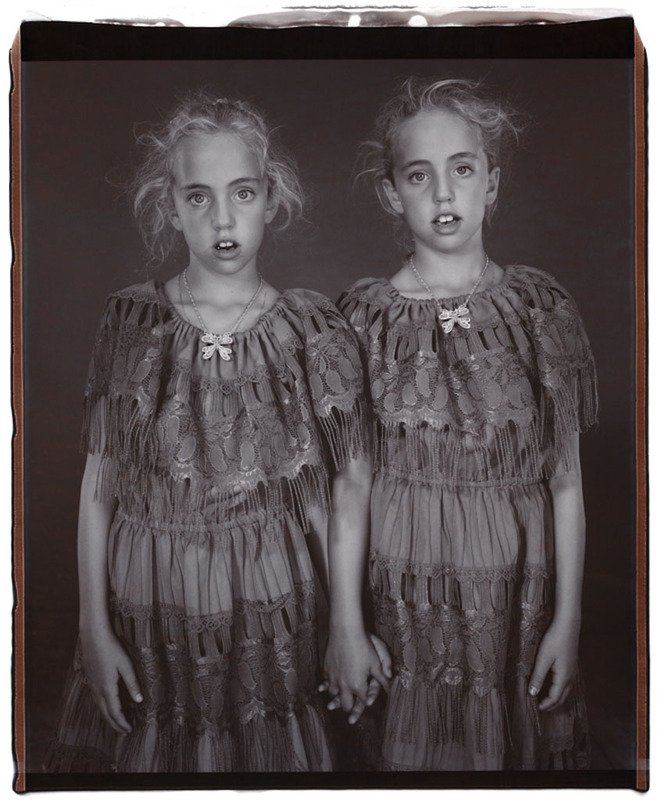 Heather and Kelsey Dietrick, Twinsburg, Ohio 2002 copyright by Mary Ellen Mark. The following text is a reprint from June 9, 2014 issue of L’Oeil de la Photographie. American photographer Mary Ellen Mark has been taking pictures for more than 50 years. In May the Stills Gallery in Sydney hosted her first solo exhibition in Australia featuring a number of images from the eighties and nineties including some shot for National Geographic in 1987 for a story on Australian Immigrants. More recently she’s worked in Australia as a stills photographer on three of Baz Luhrmann’s films – ‘The Great Gatsby’ and ‘Moulin Rouge’ in Sydney, and ‘Australia’ in the remote town of Kununurra in Western Australia, 3,040 kilometres (1,889 miles) from Perth. I can tell by the way Mark pronounces” Kun-un-urra” that she is still savouring that quintessential Australian outback experience. Of her time with Baz and his multi-Oscar winning wife Catherine ‘CM’ Martin she says, “Great people, brilliant”. Internationally Mark is equally renowned for her film stills as well her documentary photography and she’s managed to successfully live in both worlds without losing her visual signature. She is credited with shooting more than 50 films including ‘Tootsie,’ ‘One Flew over the Cuckoo’s Nest,’ ‘Apocalypse Now’ and Fellini’s ‘Satyricon’. Mark tells me these commissions, and her magazine work, have funded her personal projects, which lie at the heart of her photographic practice. Like other notable photographers Mark studied painting and art history before photography came into her life. “When I went to university I wanted to be either an architect or painter, a fine artist; I found being a painter very isolating. As for being an architect, that’s very academic, very difficult and I am not a good engineer,” she laughs. At graduate school Mark took a major in photojournalism; it was a light bulb moment. “Photography became an immediate love for me. I had always read books about photography and was always fascinated with great photography. But it hadn’t occurred to me that it was something I could do myself until I got to graduate school and picked up a camera in my very early twenties”. Following graduation Mark secured work with publications she’d grown up with such as LIFE. “In the Sixties there was a real life for a photographer working in magazines. Magazines needed great photography and they believed in it. I wanted to be an artist and take pictures that move people and that would last far beyond my lifetime. I wanted to become really great at what I did,that’s always been my goal”. “I always thought of magazines as kind of my grants. A lot of the time they’d let me go and work on my ideas. It was a great time, but it’s changed. I think work for magazines now is very illustrative, and I’m not an illustrator, I’m a storyteller. Today images in magazines are controlled by post-production, that’s the real artist not the photographer,” says Mark. “Magazines are not interested in work that is very personal. They want work that can be changed with a grey or blue filter in post-production. If young photographers are interested in what I was, in telling stories, they have to pursue that. Don’t let technology push you around”. While Mark hasn’t made the shift to digital – she still shoots medium format and 35mm film – she says, “I am not against it. I teach and most of my students shoot digitally and some make great pictures. But for me it is a different mindset as it involves the computer. It’s a different thought process, and I know film so well and I love the prints…I don’t want to give that up”. It isn’t nostalgia colouring her view when she speaks of the constant bombardment of imagery from cyberspace. Mark says the current level of activity in photography has “lowered the bar. I don’t think people know what good photography is anymore, not just the public but those working on magazines also. There is no discrimination, everything is uploaded, downloaded, and we are inundated with images. People are not dazzled anymore by how difficult it is to take great pictures”. Continuing she says, “We used to look at magazines and see the pictures of great photographers who took incredible images that stuck in our minds forever. Now we are seeing average nothingness. I mean it is true that anyone can take a picture, and some make good pictures, but it is very hard to make great pictures, very hard and I don’t think people know the difference anymore. I think people are becoming numb”. I ask – ‘who, in your opinion, are the ‘great photographers’? The phone line goes quiet while she mulls the question. “I’m looking at my wall in the studio, I have a lot of prints up here, people whose work I really love,” she tells me down the line from New York. “For me the photographers who were the great photographers are still the great ones – W. Eugene Smith, Irving Penn, André Kertész, Manuel Álvarez Bravo, Margaret Bourke-White, Helen Levitt…A great contemporary photographer is Graciela Iturbide from Mexico. With the great images I think they heighten peoples awareness about life and about art and humanity”. We talk about photography as an agent of change and Mark tells me, “I think the kind of photography that can contribute to change are photographs that relate more to war and disaster. I have a lot of respect for the people who have done great photographs of (these), but I’ve never had the nerve to do that. As far as looking at things like poverty for example, I am not sure that photography contributes to change, but I think it opens peoples minds to look at humanity in a more heartfelt way”. Throughout her career Mark has been drawn to stories that fall outside the mainstream – brothels in Bombay, street kids in Seattle, pregnant teens, circus performers – creating visual explorations that peel back the layers of the human experience. Very much her own woman – Mark is one of few that have rescinded their Magnum Photos membership – she is still resolute in carving her own path. Like many great photo essays her idea for ‘Falkland Road: Prostitutes of Bombay’, which became one of her most lauded projects,­ came by chance. “When I first went to India in the late sixties someone took me to Falkland Road. It made a lasting impression on me and I said I’m going to come back here to photograph these women. It took ten years to pull it together, but I did go back and photograph them. You have to be determined. I’m proud of that work and nothing has come close to it as far as the intimacy and the look into the lives of these women. People still struggle with how to deal with that work”. ‘Falkland Road: Prostitutes of Bombay’­ became a book, one of the 18 she has published. ‘Man and Beast’ was released this year and is her latest, featuring works from Mexico and India. Here Mark’s images explore the complex relationship between humans and animals, one of the topics of fascination for this erudite photographer. Currently she and her filmmaker husband Martin Bell are working on a sequel to Bell’s 1983 film Streetwise. Again this story began by chance. Mark was on assignment in Seattle for LIFE magazine shooting a story on runaway children. After photographing these children and hearing their stories, Mark went home to Bell with enthusiasm to pursue the story in greater depth. Bell agreed and later that year the pair returned to Seattle to make the documentary film. Since then they’ve been following the life of one of that film’s protagonist, Tiny, who they met as a 13-year-old prostitute living on the streets of Seattle. Mark says Tiny is now a mother of ten. There is also a book of this work. “All my projects mean something to me,” says Mark. “I develop relationships with many of my subjects and l love going back, I really believe in going back. It’s very moving when a project ends and yes, it’s sad. But I’ve always felt you are only as good as the next thing you do so I’ve made myself move on.” At 74 years she has no intention of slowing down, there are too many stories left to tell. It is late in the day in New York as we end our interview. Mark’s voice is full of an energy that belies her years. As we get ready to hang up she says, “Call me if you need anything else, if you have more questions. It was a pleasure”.